This is Bj�rk's "Icelandic" album - made with the Icelandic String Quartet and full of raw backing electronic beats that she feels describe audially what Iceland's landscape looks like with its rugged mountains, volcanoes, and geysers. The songs are very personal and yet universal at the same time, with very simple but deep lyrics. The best two examples of that are my two favorite songs on the album, which appear one after another, J�ga and Unravel. J�ga is perhaps one of the prettiest songs Bjork has done, the strings are almost classical sounding, but also passionate sounding at the the same time, the vocals are pretty but even more passionate, and all of this is on top of a great backing beat. J�ga is the name of her best friend who she wrote the song for, and she says "coincidence makes sense only with you...you don't have to speak I feel emotional landscapes" and that her friend brings her to a "State of emergency...how beautiful to be" Great lyrics. And you can hear the excitement in her voice when she says "how beautiful to be"
we'll have to make new love"
so simple and yet it's defintely some of the best poetry I've ever heard. This whole song is simple, but it is very powerful and soothing. Soothing is a theme on the album, as in "All Neon Like" she sing "Don't get angry with yourself, I'll heal you" People may think overly emotional people can be weak, but Bjork shows the power in that kind of person to be able to heal. 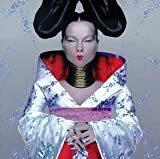 And at the end of the album is "All is Full of Love" - one of most people's favorite Bjork songs once they hear it with a great message for anyone who's ever felt unloved- which I'm guessing is everyone. Check this album out if you want to hear some of Bjork's best work, because it's simple, direct, heartfelt, and beautiful.